So, you’re social following is growing—now what do you do with all these new fans? An engaged social following is only worth what you make of it . . . so… do something with it! With that in mind, we want to share one of the quickest and most seamless ways to turn followers into customers: email marketing. We had the distinct honor of interviewing email-marketing guru DJ Waldow, author of “The Rebel’s Guide to Email Marketing” (available here on Amazon, but don’t go there quite yet — you’ll have an opportunity to win a free copy at the end of this article). GLEN: So, DJ Waldow, we want to build up our email marketing program—how can we do that using social media? DJ WALDOW: The easiest way to build up your email database is to get your social fans to opt-in to your email newsletter. If you have a strong following on various social networks, the simplest way to get people to opt into your newsletter is to just simply ask them. I know that sounds very, very obvious but I honestly don’t have a lot of examples of companies even doing that—let alone doing it well! GLEN: So, seriously, we just need . . . to ask? DJ WALDOW: Yes. If you have a strong following on Facebook, it can be as simple as posting on your wall: “Hey, did you know that we also have a newsletter? Sign up here now!” Wherever your social media community lives—Twitter, Facebook, LinkedIn—ask them to subscribe to your newsletter. Of course, standard marketing rules apply: you’ll want a benefit-driven call-to-action. I have found that focusing on “exclusive offers” (i.e. “Don’t miss out! Sign up for our e-newsletter now!”) works well for social media because these customers know they cannot possibly see everything in their Twitter stream and they don’t like to miss out on anything important. You may want to offer an incentive like a discount, free service, etc. to nudge them into subscribing. You can also use content downloads to drive subscriptions. GLEN: Ok, so now assume that we have a strong email marketing campaign—how can we integrate social into our emails? DJ WALDOW: There are actually two primary ways you can integrate social into emails: social sharing and social connecting. GLEN: What’s the difference between social sharing and social connecting? Social connecting, however, is when you use your email to try and gather social followers/fans. You could send out an email that says, “Hey did you know we are also on Facebook and Twitter, follow us here” or “Here are the fifteen reasons you should follow us” and gain social followers that way. GLEN: Cool. Could we potentially combine those two? DJ WALDOW: Yes, you can — and you should! Combine social sharing and social connecting by offering contests with click-thrus (when an audience member clicks-thru to your website, landing page or any other digital homebase), comments, sharing, etc. This serves two purposes: you can track and identify key influencers this way and it also builds up your social community. GLEN: Any final tips for using social media data in email? DJ WALDOW: Think of it this way: the inbox is a much more personal and intimate place than social channels. The problem with social media is that there is no way you can capture everything and there’s no way you can see everything. So if you want to give your content a better chance of being seen you really need to also be focusing on email marketing not just social media marketing. GLEN: Makes perfect sense to us . . .thanks, DJ! Been there, done that? 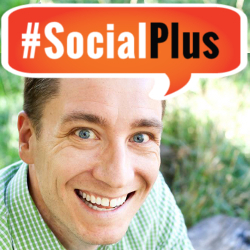 Or got some great ideas for #SocialPlus Email? Tell Us! And win a free copy of “The Rebel’s Guide to Email Marketing”! Simply comment below and share you experiences or ideas. DJ will choose several winners to receive a free copy of his new book. Hint: We’ll announce the winner on Twitter and in the comment section so be sure to follow us on Twitter and subscribe to the comment feed. Glen Kosaka is the CEO and Founder of Rignite. He’s the guiding force behind Rignite’s mission to help businesses grow through social media. Rock on Glen and DJ! Great interview. I’m curious as to your thoughts on whether a call to action for a “newsletter” sign up really works. Is it better to do a call to action that includes something valuable like a free download or a series of tips and include the opt-in for other great content i.e. newsletter in your form? Or does a newsletter call to action work well? I get the sense that people don’t really want another newsletter, but who knows? What do you think? Nichole! Test. Test. Test. Both can work. The key is that you have to provide SOMETHING of value to entice someone to give up their email address. It could be as simple as “access to exclusive content” or an eBook or discounts on upcoming events. Thanks for a great post and thanks for bringing this to my attention, Kim! Please do share your post that you mentioned. Would love to see it! In the post, I show a 1400% increase in subscribers. But I updated the data when I wrote the book and it’s actually 1900%. This is the lowest hanging fruit for any email marketer! Such a great post Andy! Love that you used your own site as an example with real results to show. Tweeted it and will share on Facebook. Thanks Andy. We meet again. Wait … you just looking for a free copy of the book? Ha! Please (re)share that post. It was a great one! Andy! Great news! You have won a FREE copy of my book, The Rebel’s Guide to Email Marketing. Please reply back to this comment with the best email address to reach you and we’ll have a copy sent you way. Thanks! Thanks, DJ. Here’s my email: [email protected]. If you email me a mailing address, I’ll drop a copy of my book in the mail for you. Sounds fair, doesn’t it? Great piece Glen and DJ! Does the advice apply equally to B2B and B2C or are there significant differences between the two? Yes this applies to both B2B and B2C. But remember that ‘content is king’ and if you don’t have anything of interest no one will respond. B2C may not use the term ‘newsletter’ but rather ‘Weekly Tips for …’ or ‘Daily advice column’ but it’s the same issue. Sharing great content is a prerequisite for getting signups, shares, and likes. Thanks Todd. Yeah, agree with what Glen said. 100%. Great points. I have been very active on social media, from Twitter to LinkedIn, but something has been missing. I know permission marketing is the right way to go and a good friend convinced me that an e-mail campaign tied to workshops and my social media efforts. Maybe I can find good strategies here. Hi Thaddeus. That sounds like a great idea. Using social media and email to promote workshops and vice versa (using workshops to build your email list) could be a great way to demonstrate your expertise and to grow your business. Good luck and please keep us posted on how that goes! Thaddeus! No better time to start than NOW! LOVE that example. FWIW, my father is also a dentist! Great article, Glen. DJ, thanks for sharing. I’ve been trying to figure out the best way to send out my blog posts. Although I announce them on social media and link them to my site, I also put them into email newsletter format too and send them to my newsletter recipients. But, trying to figure out if the newsletter should contain the blog, partial blog with a link to my site for the rest of the story or just a link the the blog post altogether. This is a tough one for me when thinking about gathering subscribers. Hmmmm… Enjoy you weekend! My suggestion … send a link with some short copy and include a “read more” link driving people back to your blog. Great news! 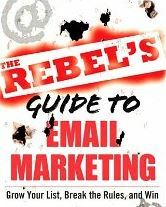 You have won a FREE copy of my book, The Rebel’s Guide to Email Marketing. Please reply back to this comment with the best email address to reach you and we’ll have a copy sent you way. Thanks! Hi there. Hope you had a great 4th of July! Please let us know where we should send your copy of DJ’s book. You can email us at [email protected] with the details. Thanks! I guess that is just my style. Thanks Iain! See … it worked. You found this post via email. Ha! And always use your own style. Great interview. We just started putting all of our contacts, followers and subscribers into Salesforce.com so we can insure that when we send out our newsletter we have everyone covered. Will also help with any opt-out issues. Great advice! I too, am guilty of not asking folks to sign up for my newsletter. One thing I have learned is that consistency is key; otherwise your readers will forget who you are and will unsubscribe. DJ – I’m glad to know that sending a short blurb about the article and sending readers back to the website works. I’ve been worried about trying that. Shelley! Do it. NOW. Seriously. Stop what you are doing and get an opt-in on our site/blog. Shelley: Great news! You have won a FREE copy of my book, The Rebel’s Guide to Email Marketing. Please reply back to this comment with the best email address to reach you and we’ll have a copy sent you way. Thanks! Hi Shelley. Hope you had a great 4th of July! Please let us know where we should send your copy of DJ’s book. You can email us at [email protected] with the details. Thanks! Thanks, DJ and Glen, for the reminder to nurture and develop deeper relationships with email. It takes effort to write an interesting and useful newsletter every week or month, but it’s so worth it, especially with B2B. It doesn’t hurt to ask! It can feel a bit weird, but if you don’t ask ’em … and they leave your site (which they will) … they may never return. Ask for the email address!